By buying this product you can collect up to 10696 bonuspoints. Ånglok med tender klass 05 typ DRB, loket har DCC/mfx digitaldekoder och ljudmodul, högeffektsdrivning, längd över buffertar 31,0 cm, epok II. Prototype: German State Railroad (DRB) class 05 streamlined express steam locomotive. Version with powdered coal firing and the engineer's cab at the front. Deep black basic paint scheme with a white decorative stripe. Road number 05 003. The locomotive looks as it did around 1937. Model: The locomotive has DCC/mfx digital decoder and extensive sound functions. Powdered coal being moved with a compressor (Operating Sounds 1) can be activated by means of the function button. The locomotive has controlled high-efficiency propulsion with a flywheel, mounted in the boiler. 3 axles powered. Traction tires. The locomotive and tender are constructed mostly of metal. 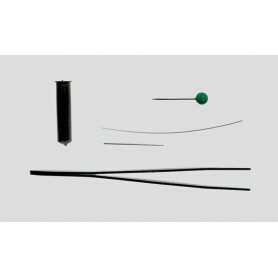 Minimum radius for operation is 437 mm / 17-3/16'. Cutouts in the side streamlining for smaller track curves can be filled in with add-on fill pieces. The dual headlights change over with the direction of travel, will work in conventional operation, and can be controlled digitally. A third headlight as a headlight for oncoming trains can be controlled separately in digital operation. The engineer's cab lighting can be controlled separately in digital operation. Maintenance-free, warm white LEDs are used for the lighting. The locomotive and tender have numerous, separately applied grab irons. A 7226 smoke generator can be installed on the locomotive. There is a permanent close coupling between the locomotive and tender. Length over the buffers 31.0 cm / 12-1/4'. Highlights: Locomotive and tender constructed mostly of metal. Digital decoder and extensive sound functions included. 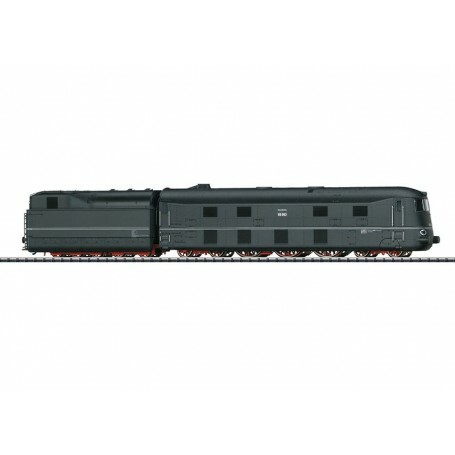 This model can be found in an AC version in the Märklin H0 assortment under item number 39054.